Cyndi Hilton isn’t part of the famous family that shares her name, but she might as well be. She could easily decorate a fine hotel lobby with pieces from her eclectically elegant Orinda showroom. For nine years, the former credit union executive has been a preeminent purveyor of secondhand home furnishings, jewelry and other items from estate sales and individual sellers throughout the East Bay. Shoppers won’t find discount store brand names among the china, rugs, hutches and crystal stemware on display at the store, at 21 Orinda Way. Rather, the store is chock full of names like Waterford and Wedgewood. “We help people recycle good things,” said Hilton, who has lived in Orinda for 30 years. called to lend expert advice to sellers who need to liquidate collections for quick cash. “We end up helping a lot of people,” she said. coming into the business, which is spread out over two showrooms in a village shopping complex. Sue Breedlove, president of the Orinda Chamber of Commerce, of which Hilton is a longtime member, said the store is an economic asset for the community. A former chief executive officer of First United Services credit union, Hilton also owned her own advertising firm before entering the high-tech industry. After retiring a decade ago, she quickly became bored and started looking for a new business venture. Hilton, whose is married to physician Magdy Girgis and has two children, remembers staring at her own china cabinet and knowing she had no need for much of what was there. What she didn’t know, however, was how to depart with things that still had great value. The idea to open a high-end consignment store hit her. Customers contract with the store sell their furniture, art, jewelry and other baubles. Hilton keeps 40 to 60 percent of the sale proceeds, depending on the item. Furniture and tabletop items are kept for 45 days before owners are asked to pick them up. Otherwise, they are donated to groups like Children’s Hospital Oakland or Hospice of Contra Costa County. Longtime customer Nancy Kelly, a former Piedmont resident who now lives in Reno, visits Hilton House whenever she returns. A collector of Asian pottery, she is intrigued by the numerous items Hilton collects from estate sales, and said the staff understands how to determine the value of fine items. 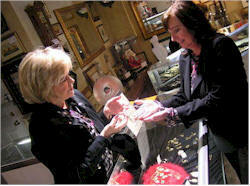 Cyndi Hilton, left, owner of Hilton House in Orinda, shows a gold-and-diamond necklace to customer Carol Yates. 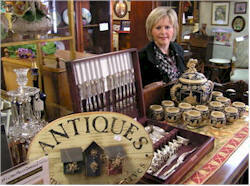 Hilton House specializes in handling fine china and antiques from estate sale. The Orinda Way business was founded by Cyndi Hilton, a former credit union executive and 30-year Orinda resident.